If you or someone you know is showing some of the symptoms of Alzheimer's disease, it is time to schedule an evaluation. You can do an at-home check to bring with you to the appointment. The doctor will do screening assessments as well as review symptoms and medical history. An accurate diagnosis early in Alzheimer's disease allows for appropriate treatment to begin sooner. Understanding what questions or tests will be done can help you and your loved ones through this process. Don't panic at the first sign of forgetfulness. It's normal to forget from time to time where you put your glasses or the overdue library book. Alzheimer's is not a minor episode of forgetfulness, nor is it a sudden change in cognition; rather, it's a gradual progression of symptoms over time. Keep track of the symptoms over the course of a few months. Consider asking a trusted family or friend for input as well. When calling to make an appointment with your doctor, briefly share your observations and ask for an evaluation for Alzheimer's and other kinds of dementia. Bring the list of symptoms and any questions you can think of to your doctor. The online Self-Administered Gerocognitive Exam (SAGE) can be downloaded and taken at home. This self-screening dementia tool has been scientifically evaluated and has demonstrated good results in accurately identifying cognitive deficits. A key part of that accuracy is bringing it to your doctor for scoring and interpretation rather than doing so yourself. Any at-home screening test should be followed up with an assessment by a physician. There are many marketed direct to consumers that are not scientifically validated and they may give inaccurate results. Different kinds of physicians can diagnose Alzheimer's disease. You can make an appointment with your primary care doctor or seek out a specialist such as a psychologist, geriatric psychiatrist, neurologist, neuropsychiatrist, or geropsychiatrist. Some communities have specific programs that specialize in Alzheimer's testing and diagnosing, so check out your local Alzheimer's Association for recommendations. The physician may ask the person and a loved one to tell them about the symptoms they've experienced to determine if they are consistent with the symptoms of Alzheimer's disease. You may be asked if there are other health conditions that you have been diagnosed with or any additional symptoms you've been experiencing. If you're at a new doctor's office, they may request that you have your records sent from your primary care physician ahead of time so that they know your personal history and current medical conditions. Additionally, your family history for different kinds of dementia and health conditions will likely be reviewed, as well as any current medications, over-the-counter drugs, vitamins, and supplements you are taking. A mental status exam is often used to objectively evaluate cognitive functioning. There are several screening tests to evaluate cognition, but one of the more common exams is the Mini Mental State Exam (MMSE). This exam tests different aspects of the ability of the brain, such as memory, calculation, orientation, and communication. The Alzheimer's Disease Assessment Scale-Cognitive Subscale test (ADAS-Cog) is an 11-part test often used after diagnosis of Alzheimer's disease to assess the level of impairment. It focuses on attention, language, orientation, executive functioning, and memory skills. Mini-Cog: This is a three-item screening test combining recall and a clock-drawing test. It takes only a few minutes to administer. Montreal Cognitive Assessment (MoCA): This is a brief screening test to determine quickly whether a further workup is needed. It includes a clock-drawing test the Trails B test of executive function. Clock-Drawing Test: This test is often a part of other screening tests. Simply drawing a clock with the numbers and hands set at a specific time can reveal problems with cognition. 7-Minute Screen (7MS): This screening test has four elements and is used for early detection of Alzheimer's disease and mild cognitive impairment. Short Blessed Test (Orientation-Memory-Concentration test): This test contains six items. AD-8 Informant Interview: This eight-item questionnaire is given to caregivers or family of the person being evaluated. It takes only a few minutes and can be done at home, then brought to an appointment with the physician. Neuropsychiatric Inventory (NPI): This test is given to caregivers to screen for Alzheimer's disease and assess problems often seen in that condition. Some physicians will order tests such as blood work or a urinalysis. These tests can screen for infections or other medical conditions that could hinder your ability to think clearly. Infections can often cause increased confusion, especially in older adults, so it's important to eliminate these and other reversible conditions as a cause. In the rare case that autosomal dominant Alzheimer's disease is suspected of being present in the family, a genetic test is available. 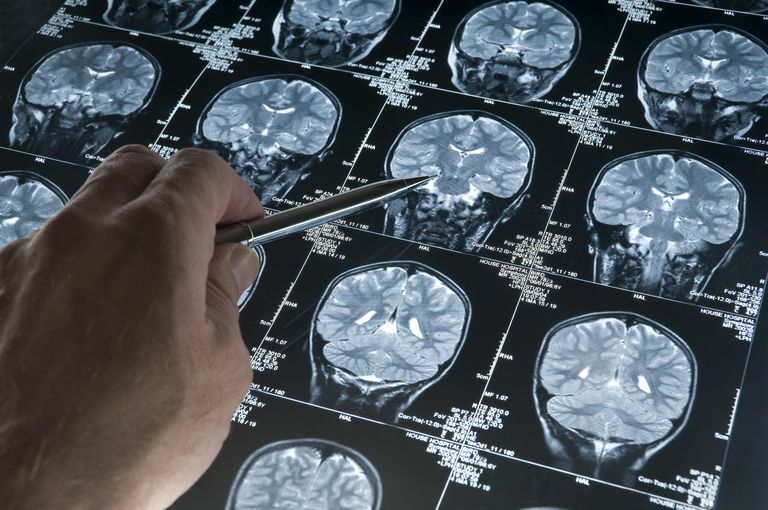 Brain changes can also be observed through various imaging techniques such as a positron emission tomography (PET) scan, a computed tomography (CT) scan, and a magnetic resonance imaging (MRI) test. MRI and CT are primarily used to rule out a tumor, stroke, trauma, or other abnormality. They don't in themselves point to a diagnosis of Alzheimer's disease. The CT scan is a sophisticated type of X-ray that might be used when the person being evaluated has metal in their body, as this means they can't have an MRI performed. The patient has to lie still in the scanner for 10 to 20 minutes. It can show a stroke, tumor, or brain shrinkage. The MRI gives a more detailed picture than the CT scan, but it requires the person to lie still in a tunnel-shaped scanner for 30 minutes. The machine is very noisy and it can feel claustrophobic. Because it uses strong magnetic fields, it can't be used for patients who have some kinds of metal in their bodies. The detailed scans can show where stroke or small areas of bleeding have occurred. PET scans use an injected low-level radioactive tracer to show how areas of the brain are functioning. The patient lies on a table that then moves into a donut-shaped scanner. It is much quieter than an MRI, but it is a lengthy procedure. The fluorodexoyglucose (FDG) PET can show where the brain has low metabolism that may match some forms of dementia. Amyloid PET scans look for the deposits of amyloid plaques that are typical of Alzheimer's disease. Tau PET scans are mostly used in research. These look for the tau protein tangles seen in Alzheimer's disease. The exam should include an evaluation for reversible conditions that can mimic Alzheimer's disease. You or your loved ones may fear that the symptoms are due to Alzheimer's when they could be produced by many other conditions, such as depression or delirium due to an infection that will improve with the right treatment. Problems with memory may be diagnosed as mild cognitive impairment, in which the person has normal overall cognition and can still do their daily activities. There is a greater risk of dementia, but it is not inevitable. Vascular dementia: This develops due to interruption of blood flow in the brain. It is sudden or step-like in onset. It can be due to a specific event such as a stroke or transient ischemic attack. Behavioral variant frontotemporal dementia (Pick's disease): This condition has some overlapping symptoms with Alzheimer's disease since both diseases typically affect cognition, emotion, and behaviors. Parkinson's disease dementia (PDD): This dementia is seen especially after a person has Parkinson's disease for a number of years. People with PDD usually have problems with attention, executive functioning, and memory retrieval, as opposed to Alzheimer's disease where the person has problems storing memories. Any significant, sudden change in someone's ability to think merits a call to your doctor immediately, as this may be a sign of a treatable condition such as delirium. It can be nerve-racking to wait for answers and scary to receive a diagnosis of Alzheimer's or dementia, but early diagnosis allows time for you to plan ahead and make decisions. Although difficult, knowing what you or your loved one is facing can allow you some control over how the progression and effects of Alzheimer's disease are handled. Having a name for the various symptoms you or your loved one has experienced can sometimes provide a sense of relief, despite the sadness that may accompany it. As you increase your understanding of Alzheimer's, you may also be able to more effectively cope with your feelings about the disease and its challenges. Biomarkers for Dementia Detection and Research. National Institutes on Aging. April 1, 2018. How Is Alzheimer's Disease Diagnosed? National Institute on Aging. May 22, 2017.